Unlike the United States, the Canadian government has strict price controls on all prescription drugs and negotiates bulk discounts with all major prescription drug manufacturers. The Canadian government also strictly prohibits direct-to-consumer advertising of prescription drugs, like many other countries around the world. When ordering through a Canadian pharmacy online, these savings are passed directly on to you! The Canadian government limits how much pharmaceutical manufactures can charge for prescription drugs when they are approved and caps subsequent price increases. All prescription drugs still under patent are regulated by the Patented Medicine Prices Review Board (PMPRB) which sets price caps for all patented prescription drugs in Canada. Each province also negotiates prices with pharmaceutical manufacturers based on the clinical effectiveness of prescription drugs. Provincial price controls also include mandates on how much individual pharmacies may markup prescription drugs, further controlling prescription drug costs for consumers. In Canada, like in many other industrialized nations around the world, it is illegal to market prescription drugs directly to the consumer. This means that Canadian prescription drug prices are not inflated by large advertising budgets like they are in the United States. Advertising of prescription drugs is illegal in Canada partially because it does not provide impartial or objective information to consumers making health decisions. 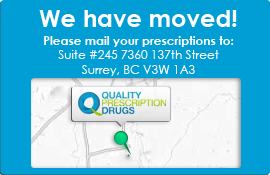 You can return to our Canadian pharmacy information site or visit our online price catalog for more information. To order your prescription drugs from Canada today, visit our "How to Order" site for instructions on how to start.